Cairo quiet on anniversary of uprising that brought down Mubarak. 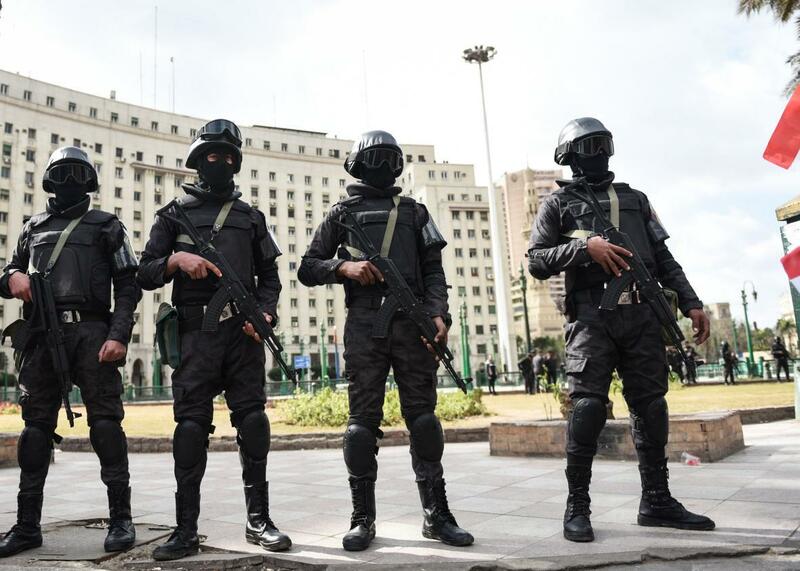 Members of the Egyptian police special forces stand guard on Cairo’s landmark Tahrir Square on Jan. 25, 2016. By all accounts, Cairo was quiet on Monday, the fifth anniversary of the uprising that toppled Hosni Mubarak. This is in stark contrast to last year’s anniversary, which saw violent clashes between demonstrators and the police, leading to the deaths of several protesters. In a televised address on Sunday, Egypt’s President Abdel Fattah al-Sisi praised the uprising’s “noble principles” but said it had deviated from its original course and been hijacked for “personal gains and narrow interests”—a reference to former President Mohamed Morsi’s Muslim Brotherhood government that ruled the country from 2012 to 2013. Morsi was overthrown and imprisoned by the military in 2013, and Sisi, a former general who turned in his uniform, was elected in a widely criticized landslide election in 2014. Advantageously, for the government’s optics, Monday’s anniversary falls of the same day as Egypt’s “police day” holiday, which dates back to the 1950s, so the largest public demonstrations in Cairo on Monday featured pro-government demonstrators celebrating by handing flowers to members of the security forces. Another reason protests are quiet this year: In the days leading up to Monday’s anniversary, authorities launched raids on cultural venues, including cafés, art galleries, and publishing houses, linked to Egypt’s secular opposition movement, and searched private homes linked to problematic Facebook accounts.